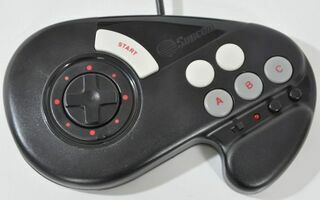 The CyberPad is a programmable control pad manufactured by Suncom for the Sega Mega Drive. It has two buttons which can be set to do various programmed "moves", and as there is a built-in battery back-up system, these moves are saved when the system is switched off. There are also turbo features. The CyberPad doesn't appear to have been sold outside of North America. A white version for the Super Nintendo also exists.